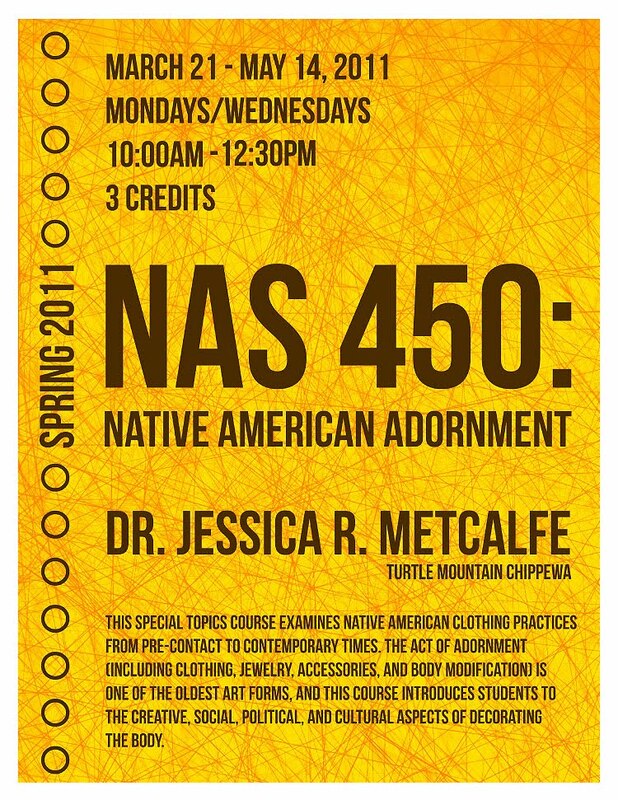 This past semester I taught a course at the University of New Mexico titled Native American Adornment. 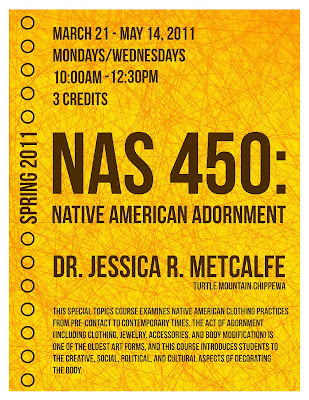 It was an upper division course in Native American Studies and Anthropology, and it focused on Native American practices of adornment from prehistory to the present. Throughout the term, we investigated the creative, social, political and cultural aspects of decorating the body. It was a terrific class, and I had a group of bright students who enthusiastically took on the course requirements and did an amazing job. 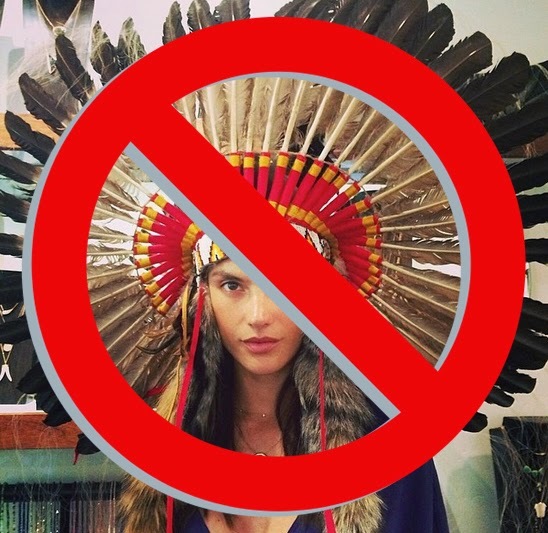 One of the requirements was to attend Native fashion or cultural events, and write a succinct review. The purposes of the assignment were to get students to view the garments on the body and in motion, to see and experience the community aspects of clothing and adornment, and to get students to think critically about these events. It is probably one of the greatest showcases of indigenous peoples gathering in the world, and depending on what your view is of this pow wow, it still is a spectacle to see and be a part of. 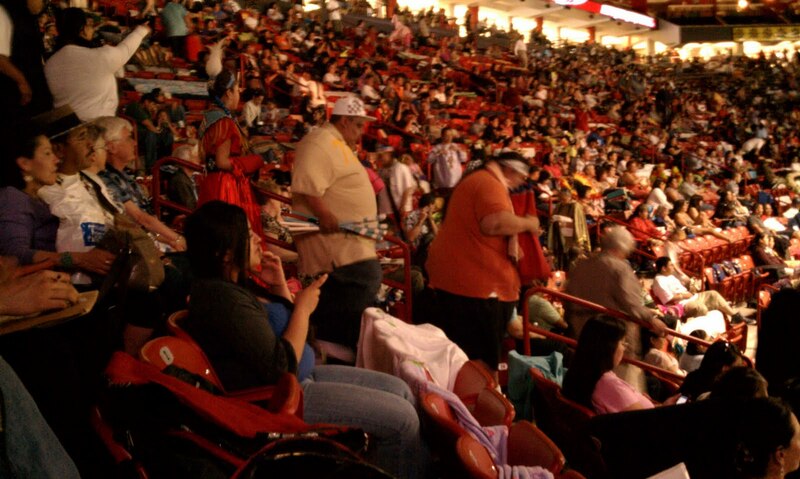 Every year thousands of individuals make there way to Albuquerque, New Mexico for the Gathering of Nations Pow Wow to be included in what has become a showing of quasi-indianism in the United States. If you are not a dancer, you’re a family member of a dancer and if your not participating in the pow wow, you have come to the pow wow to listen and watch the high sound and colorful costume. For thousands of people come to share their personal expressions of themselves and their culture. 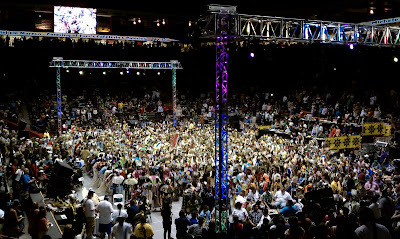 This year with the remodeling of The Pit here in Albuquerque, it has become more of a relaxed setting for many. Halls are not crowded and access is comforting. 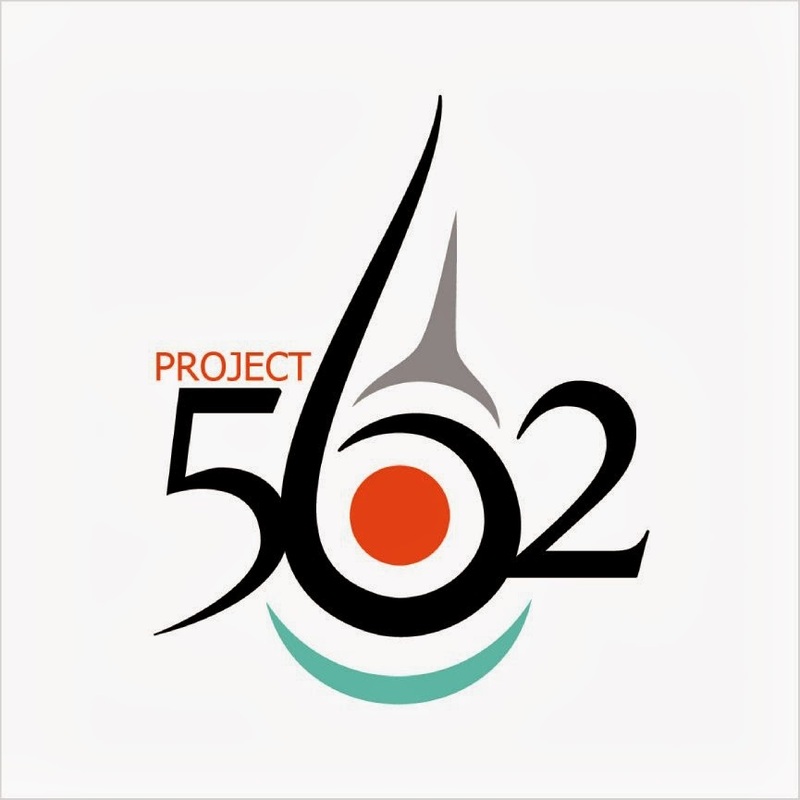 People come to this event with shutter speeds set to high and consent forms just in case, to take pictures of the regalia, costumes and meaningful conclusions of the thousands of dancers on display. Each individual lays down a significant pattern of style to each of what they wear across their body. Each person is of a different tribe descending from parts all over the country. Each person in detail carries a history of themselves and their people in the personal design of their outfit, as they are the fashion creators. Even though that tradition and culture may not have included itself in each persons history with the pow wow, times change, and now it serves as a tribalization of oneself. In what is the official kick off to a pow wow, the grand entry gives a beautiful display of what the night has to offer. All of the dancers and singers get the chance to loudly welcome themselves to the arena and come together as one, to join each other in color and warmth. Each come to dance and sing in hide, wing and color. Eagle feathers drape themselves in accordance with the northern traditional men. 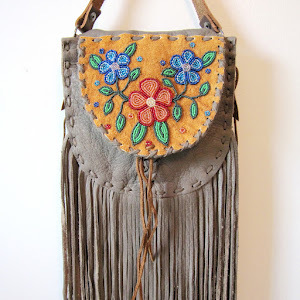 Deer hide and with color are carried in strong context in the women’s tradition northern cloth category. As they listen and dance in succession, the long exaggerated fringe from their blankets never touch the floor, but swing front to back to compliment the beat of the drum. To the jingle dress dancers, as onlookers we cannot see the detail of each curved piece of metal, but can hear in its entirety the continued beat of the woman inside that dress. The goal of a pow wow is a chance for indigenous peoples to come together in celebration of itself and its individual expression. Some pow wow’s post high dollar in competition to bring the best dancers. Some dancers go where the money is to compete and gain such accolades. 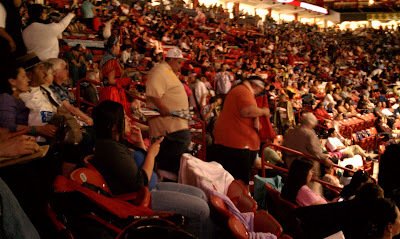 For whatever reason people come to the Gathering of Nations Pow Wow, it gives me a good feeling to know that there are tribal people uniting under one roof to talk, laugh, and change in view the sights and sounds of a continued people in these modern times. Where else are you going to get an actual “Navajo Taco” made by Navajos for $8.00?